We’re not sailors, yachties or cruisers, we’re just travellers who want to make our way from one point to the next. If you look out from any waterfront restaurant or hotel in the Grenadines, you’ll see numerous sailboats, catamarans and yachts anchored out there, bobbing slowly from side to side. 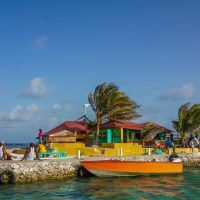 People whiz into shore from their liveaboard ships on small, motorized dinghies to replenish their boat with necessary provisions – which consist mainly of beer and rum! So, on this particular day in travel, we got the chance to feel like sailors! We were about to embark on a full day of sailing from Union Island to Palm Island, Mayreau Island, the Tobago Cays and back. 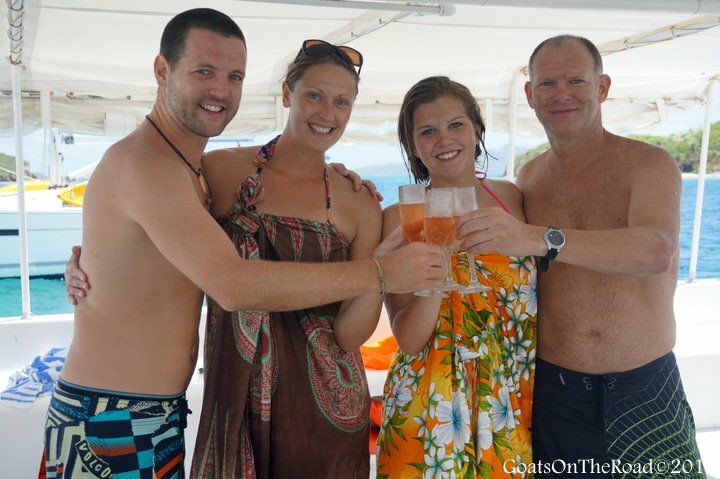 It would be us, our two Canadian friends and another English couple on the 60 foot Yannis Catamaran. Our friend Marius at Kings Landing Hotel contacted the boat for us and we were greeted by the crew at the pier. We were so excited for our day of sailing, snorkelling and sipping on rum punches! 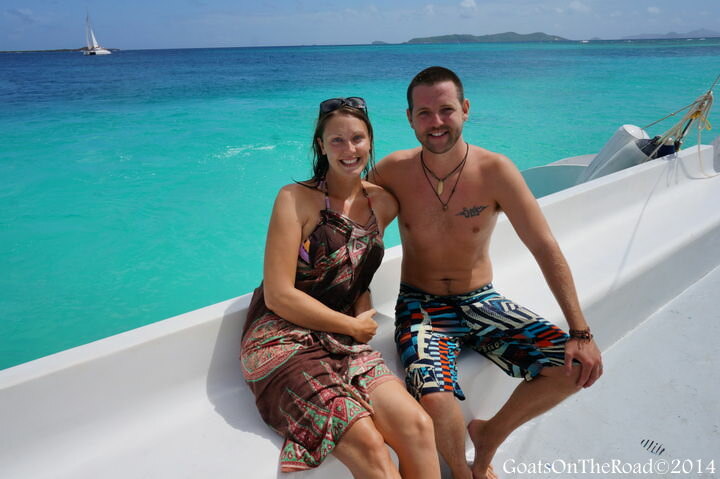 So excited for our day of sailing in the Grenadines! Click Here To Jump To The Cool Video! Our first stop was nearby Palm Island, an exclusive, private island with nothing more than the stunning Palm Island Resort, over 2,000 palm trees and a few iguanas. 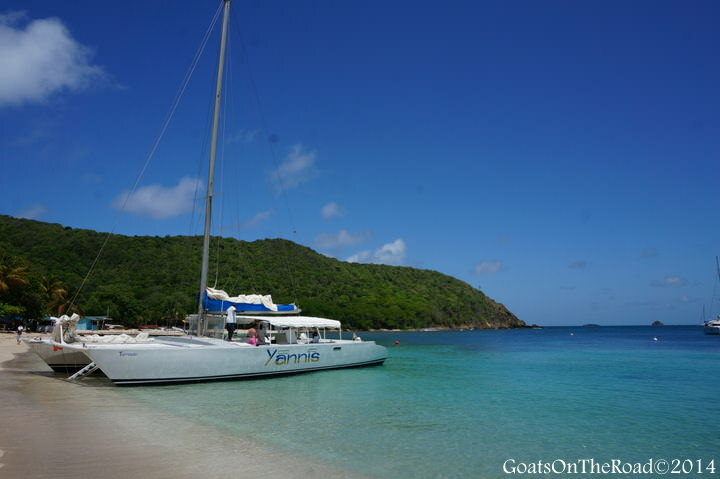 Since we were with the Yannis Catamaran, which was booked through this resort, we were allowed to splash around in the waters surrounding the island for a while before moving on. This private beach had a steep gradient into the translucent water and it truly was perfection. On Palm Island – this looks like a postcard! After our morning swim, it was time to get back on to the boat and indulge in the fabulous breakfast as we slowly sailed over to the island of Mayreau. Bacon, sausage, eggs, toast and pastries were on offer and we all inhaled breakfast before washing it down with a morning beer. It felt very luxurious having so much space on the catamaran, we could stand up, walk around, dance or lay on the front of the boat on the woven nets. The crew was so attentive and accommodating, which made the trip all the more enjoyable. 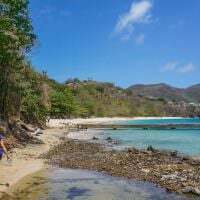 We had heard about Saltwhistle Bay at Mayreau Island and wanted to spend some time at that beach, so, the captain veered off towards the bay and did as we had requested. What service! 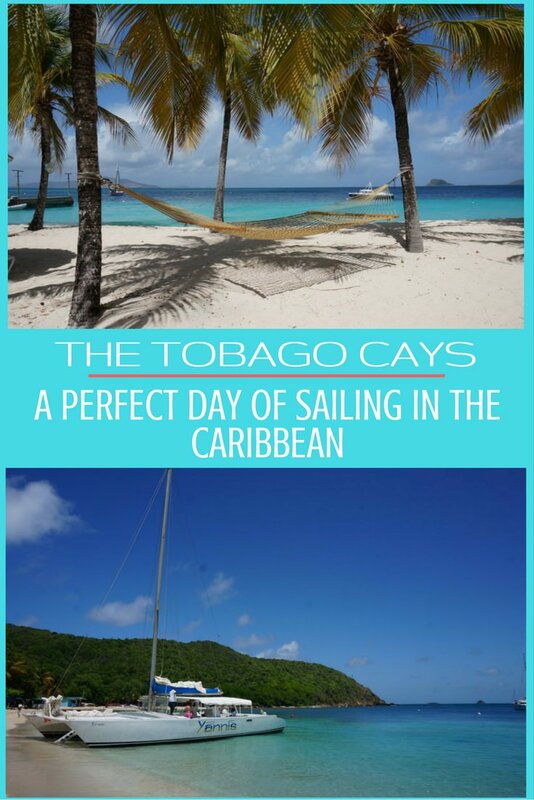 From Mayreau, the sail was lifted again and we took off to the famous Tobago Cays – the place we were most looking forward to on our trip through the Grenadines. Usually when we’re really excited about a trip, the rain gods decide to pour down on us, but luck was on our side and we had the clearest skies, which only made the waters look even more magical. The Tobago Cays are an archipelago consisting of 5 uninhabited islands: Petit Rameau, Petit Bateau, Baradol, Petit Tobac and Jamesby. Petit Tobac is where Johnny Depp and Keira Knightly were stranded in the first Pirates Of The Caribbean movie (where she set fire to Jack Sparrow’s rum!). It is said that Johnny etched his name into one of the trees…but the famous palm has yet to be found. Pulling in to the Tobago Cays! As our catamaran glided effortlessly over the glass-calm water and through the entrance to the cays, a smile came across all of our faces. This was the most picture-perfect, idyllic place we had seen so far on our travels! The Tobago Cays are known as the Jewel of St. Vincent and The Grenadines, and now we knew why. The Yannis dropped the anchor onto the soft sand below and we all donned our fins and masks and jumped off into the water for some snorkelling. We knew there would be Green Turtles here, but we didn’t realize there would be so many! The numbers were fantastic, it was amazing to snorkel alongside the turtles as they munched on the seagrass and came up for breaths of air. Apparently, each year 10,000 cruise ship goers visit the cays, while 3,000 yachts anchor here and numerous day-trippers come from nearby hotels. But when we visited, it was just our boat and three others there! A perk of travelling in the off-season. 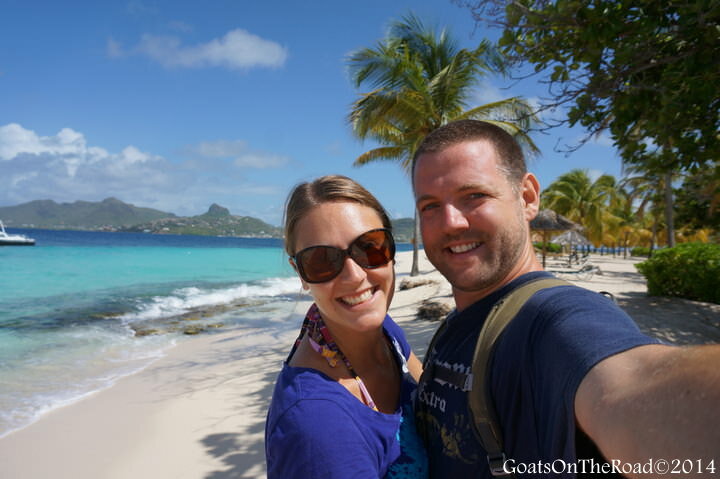 It was great to have the Tobago Cays virtually to ourselves! Not only did we enjoy the turtles, but we saw a massive sting ray as well as flounder, box and star fish. Usually the snorkel gear on tours can be pretty dismal, but the equipment provided was in excellent shape and was a good quality brand as well. After being in the salt water for too long, turning our skin prune-like, we felt it was time to come out onto dry land and were happy to see the buffet lunch set out for us – fresh tuna, hearts of palm, rice, green salad, bbq chicken, fresh fruits…and champagne! Cheers to the awesome tour and new friends! We snorkelled at two different sites in the Cays, with the second one being right alongside the Horseshoe Reef. Although there weren’t any turtles here, we saw massive conch, a nurse shark, schools of fish and some nice coral. With Jack Sparrow’s island as a backdrop, we floated in ecstasy in the tranquil waters! It was truly a special moment in travel. In fact, the entire day was fantastic and as we sailed back towards Palm Island for one final swim, we all felt that this was one of the best tours we had ever been on. A visit to the Grenadines wouldn’t be complete without sailing through the incredible Tobago Cays, it’s a once in a lifetime trip and one that we’ll always remember. 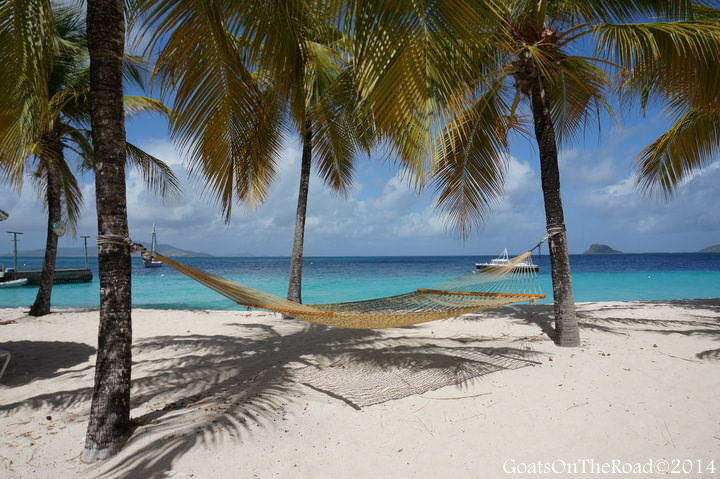 Check out this quick video of the stunning Tobago Cays! We highly recommend the tour with Yannis Catamaran through the Palm Island Resort. Many fishermen and boat operators will approach you on the street and offer to take you, but it’ll be in a small fishing boat, without snorkel gear and you won’t get the full effect of the Cays that way. It’s much more enjoyable to sail! The cost is only $100 USD/person (minimum of 4 needed for the tour), which includes unlimited alcohol and soft drinks, breakfast, lunch, snorkel equipment, 6 hours of sailing and 5 attentive crew members. This tour is excellent value for money. Contact: [email protected] or 1.784.458.8824 for bookings. A huge thank you to the crew of the Yannis Catamaran and Palm Island Resort for hosting us during this tour, it was one of our most memorable days of travel! As always, all thoughts, opinions and reviews remain our own. Looks great, I’ve never been sailing but love being out in the sea and hope to go one day! If you love the sea, then you would LOVE sailing in this part of the world. It’s absolutely gorgeous! That water is so blue!!! It’s a pretty good price for an entire day of sailing plus alcohol and a couple meals. What a wonderful day! Palm Island and the Tobago Cays are quite special, aren’t they? The Yannis sounds like excellent value for money – but the snorkeling with sea turtles, the white sand beaches and this day in paradise probably really can’t be measured in dollars :-). You’ve got that right! It was priceless 🙂 It’s such an amazing part of the world and seeing that many turtles in one place was really unbelievable! Ooohhh, the Maldives is somewhere we really want to go – I realize it would be total relaxation and not much else, but would still love to go. You’re right, that’s what’s great about the Tobago Cays and the Grenadines, it’s open to everyone!